What's Next: The Boring Company: Apple, the biggest tech company in the world, is also the most boring and, as far as we know, the best behaved. It has thus avoided the intense scrutiny placed on other tech firms by the public, lawmakers and the media. • Big: Apple is now worth about $945 billion. It should conceivably be at the center of the conversation about big tech's unprecedented power. 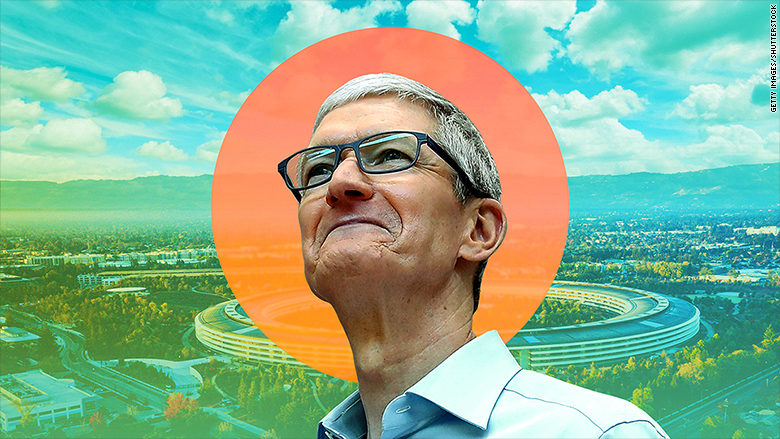 • Boring: Apple is not currently disruptive: For years, it has iterated more than it has innovated -- you can now FaceTime with 32 friends, instead of 1 -- and therefore isn't cast as a threat to the status quo. • Best Behaved: Apple has remained scandal free and capitalized on others' failures, particularly Facebook's data privacy abuses. It has also cast itself as the "good values" company with products to enhance health and well-being. The Big Picture: Apple has avoided the wrath of the "techlash" by promoting good values and capitalizing on the faults of others. It is a lesson that success in business requires principles and a competitive instinct. • "Apple said Monday that it will give users the ability to stop Facebook, Google and other platforms from tracking them across Safari through 'like' and 'share' buttons." • "'It turns out, these can be used to track you, whether you click on them or not,' Apple software VP Craig Federighi said. 'So this year, we're shutting that down.'" • "We believe one of the most offensive things is when you are on another website but this website that you were on three or four times earlier is still tracking what you're doing. We don't think that's reasonable for people." • "We write our privacy policies in plain language around the world so people will know exactly what we're doing, and we're not in the business of monetizing your data." • "People are not aware fully of how their data is being used, who has it, and I think this has to be addressed in a deep way and a thoughtful way." Starbucks executive chairman Howard Schultz will leave the company this month and may consider a run for President. "For some time now, I have been deeply concerned about our country — the growing division at home and our standing in the world," Schultz told DealBook's Andrew Ross Sorkin yesterday. "I intend to think about a range of options, and that could include public service. But I'm a long way from making any decisions about the future." Schultz this morning, to CNBC: "Let's just see what happens." Where to Fundraise: Madroneagle, Oprah's newly bought 43-acre estate on Orcas Island, 75 miles north of Seattle. • "The California governor's race ... has devolved into a king-size flop. ... The leading candidates sit largely indistinguishable on issues of substance, with little evidence of any intraparty, values-laden clash." • "The contest ... has morphed into a bizarre exercise in gaming California's unusual, top-two primary system. ... Lt. Gov. Gavin Newsom and former Los Angeles Mayor Antonio Villaraigosa [have] focused their attention on elevating one of two lesser-known Republican candidates in an effort to manipulate the election's outcome." • "Even if the Democratic candidates had aired substantive issues during the campaign, it's unlikely many voters would have noticed. ... Just 13 percent of registered voters said they had watched or listened to any gubernatorial debate this year." What's Next: Polls close at 8 p.m. Newsom is almost certain to finish first. If Villaraigosa finishes second, Siders says, "it's possible that they will engage in the kind of spirited, ideological debate that Democrats once envisioned for the 2018 campaign." Otherwise, Newsom walks to victory in November. The Big Picture: California is a proving ground for progressive policies and the lead opposition voice to the Donald Trump administration. A spirited, ideological debate about the future of the party could benefit both California and the candidates, particularly if they have their eyes on the White House. Bonus: Mountain View's City Council votes today on putting a measure on the November ballot to impose a head tax on businesses. Read: Alphabet. "Amazon has leased an additional 385,000 square feet of office space in Sunnyvale," per Silicon Valley Business Journal's Janice Bitters. "Altogether, that means Amazon is taking over six full buildings ... totaling more than 1.7 million square feet in all." Facebook is once again under fire from lawmakers after the New York Times revealed that its data-sharing partnerships with device makers like Apple and Amazon made user data vulnerable to third parties. • Rep. David Cicilline (D-RI): "Sure looks like Zuckerberg lied to Congress about whether users have 'complete control' over who sees our data on Facebook. This needs to be investigated and the people responsible need to be held accountable." • Sen. Richard Blumenthal (D-Conn.): "It feels a lot like we've been here before, Facebook. Would you like to revisit your previous statements to Congress about sharing users' data with third-parties without their consent?" • Rep. Frank Pallone (D-NJ): "It's deeply concerning that Facebook continues to withhold critical details about the information it has and shares with others. This is just the latest example of Facebook only coming forward when forced to do so by a media outlet." What's Next: Sens. Blumenthal and Ed Markey (D-Mass.) have written to Zuckerberg and asked him whether users were given the opportunity to stop Facebook from sharing their data with device makers. His answers are due by June 18. • "The state of Washington said on Monday it had sued Facebook Inc and Alphabet's Google for allegedly violating state campaign finance law by failing to maintain information about who buys election ads." Bonus: WSJ's Kirsten Grind and Deepa Seetharaman go deep on Facebook's "messy, expensive split with the founders of WhatsApp." The UK government has given both 21st Century Fox and Comcast the green light to proceed with their bids for Sky Broadcasting, setting up a bidding war that will rope in Disney. • Comcast's offer to pay £12.50 ($16.70) per share for Sky is the highest on the table. • Fox, which initially offered £10.75 ($14.40) per share, is currently being courted by both Comcast and Disney but needs Sky in case neither deal pans out. • Disney has called Sky "a crown jewel" of the Fox assets and thus has an interest in helping Fox acquire Sky before Disney acquires Fox. However this shakes out, Rupert Murdoch is likely to get significantly richer. The more Comcast drives up the price of Sky, and the more Comcast and Disney drive up the cost of Fox, the bigger the payout for him at the end. The Big Picture: Disney and Comcast have decided that scale is the best way to preserve leverage against the tech giants encroaching on their turf. (Whether that's actually the best strategy is an open question). • The sports news site "is using $30 million in venture financing to expand quickly and lure prominent journalists with premium salaries and multiyear contracts." • "The Athletic's investors are wagering that people will pay for analytical sports writing that goes beyond box scores and headlines." • "The site charges $5 a month, or $60 for an annual subscription, and says it has more than 100,000 subscribers." What's Next: Anyone's guess. Subscription models are risky for startups competing against established news organizations -- especially in sports, where coverage can be expensive. What Next: "Trusting the ESPN Process: Can Bomani Jones and Pablo Torre Create a New Version of Sports Talk TV?" by The Ringer's Bryan Curtis.